You’ll laugh, you’ll laugh more and you’ll wish you had a ghost of your own. The author of Hank Zipzer is here to show you that being haunted can be wicked fun. Lucky Billy Broccoli has his very own ghostly friend: the ghost with the most, Hoover Porterhouse. The Hoove has smooth moves and a silver tongue. That is, until the night he falls in love. When Hoover meets the ghost of a powerful princess in the museum, his brain turns into mashed potatoes. Can Billy help out – or is romance dead? Spook-a-licous! It’s a nice story, and i always knew being haunted is fun. 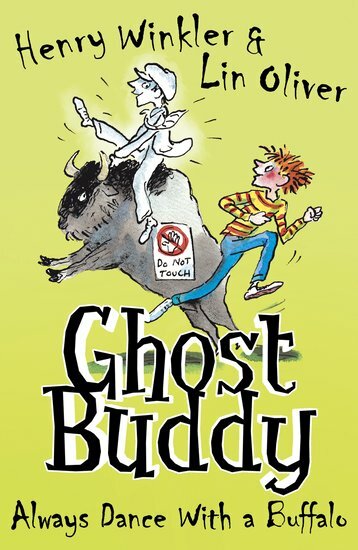 Everyone knows Henry Winkler as The Fonz from TV’s Happy Days but did you know that he’s also an acclaimed children’s book author for his Hank Zipzer and Ghost Buddy series? In 2011 Henry Winkler was awarded an OBE for his services to children’s literacy.